Whether it’s at the NCAA or NFL level, life as a football coach inevitably involves screaming at players and referees alike. But what happens when the yelling goes too far and feelings get bruised? These coaches should hope they never find out. 1. New England Patriots coach Bill Belichick is wound so tight that it would only take one bad play to send him on an expletive-shouting tirade, and that’s just not the constructive criticism his players need from him in order to learn and grow. Once that happens, Bill, be warned that there are no take-backs. 2. Alabama coach Nick Saban sure can get heated on the sidelines, which he really ought to be more mindful of before he gets caught up in a situation in which he calls one of his players a mama’s boy, makes them feel all self-conscious, and then has to apologize profusely. 3. New York Jets coach Rex Ryan has gotten in trouble in the past for going too far with his criticism of officials. Imagine what would happen if he said something really bad and it ended up cutting deeper than he intended. Man, that’d be awful. 4. Ohio State’s Urban Meyer is known for demanding a lot from his players, but when he yells at a player to toughen up or get off the field, and that player just leaves because it’s just been a really hard week…well, Urban, you’re going to regret demanding so much then, aren’t you? 5. Stanford’s David Shaw is the embodiment of serenity: He speaks sparingly and softly, his actions are reminiscent of a monk, and his blood pressure has been a steady 120/80 for all of his 42 years. But no one can keep cool forever. David’s a volcano waiting to erupt, and something tells us all of that pent-up lava is going to leave his Cardinal players in a spiral of self-pity if he isn’t careful. 6. 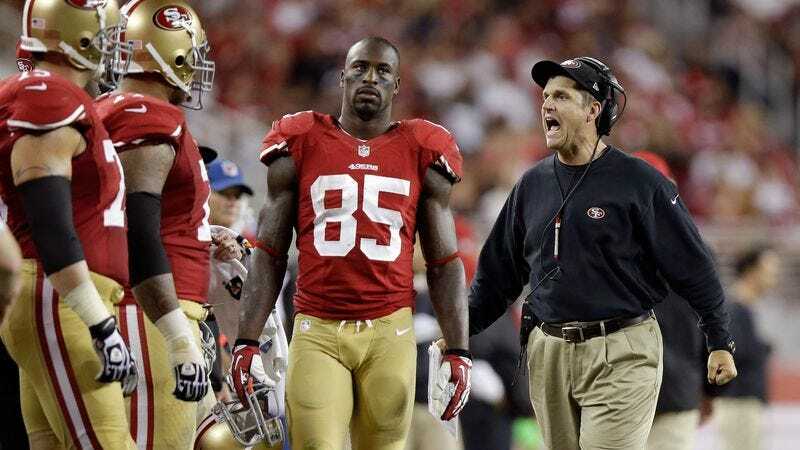 As head coach of the San Francisco 49ers, Jim Harbaugh is always yelling at his players to toughen up, but what happens when they just can’t get any tougher and completely shut down on him? What happens then, Jim? Seriously, you need to think about this kind of thing next time you’re yelling at people. 7. Seattle Seahawks coach Pete Carroll is the ultimate player’s coach who exudes positivity and camaraderie. So, if he said something seemingly harmless like “Bend your knees” or “Kick less with your heel,” it’d actually be a violent condemnation of the player’s way of life, and there’s no telling how his players would react. 8. Ron Rivera of the Carolina Panthers keeps telling his players to leave their problems at the door and just focus on the task at hand, but wasn’t it Plato who once said, “Be kind, for everyone you meet is fighting a hard battle”? Words to keep in mind, Ron. Words to keep in mind indeed.